Vigilant Investigative and Security Agency Inc., which provides security personnel to several government agencies, is owned by Solicitor General Jose Calida and his family. 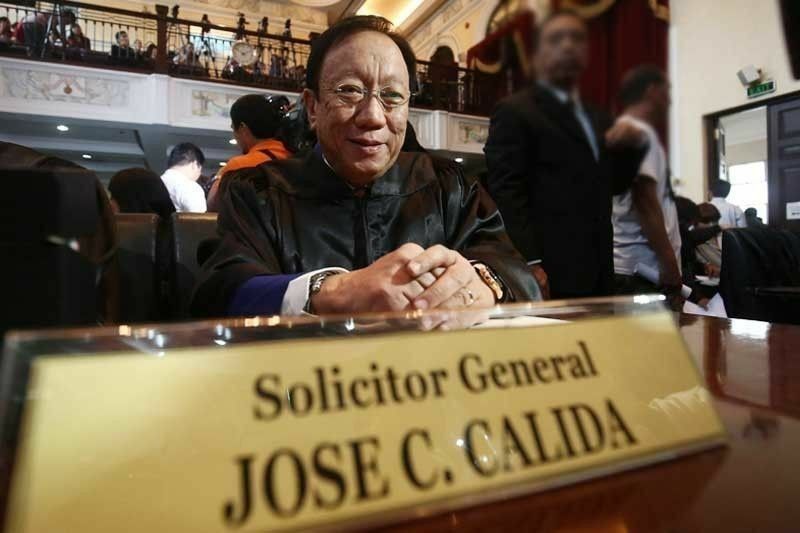 MANILA, Philippines (Updated 5:06 p.m.) — Solicitor General Jose Calida and his family have asked the Supreme Court for a halt order on a Senate inquiry into the alleged conflict of interest in his ownership of a security agency that has government contracts. Calida filed a Petition for Certiorari and Prohibition with urgent application for Issuance of Temporary Restraining Order and/or Preliminary Injunction before the SC on August 14. Solicitor general, his wife Milagros and their three children filed the petition, a copy of which was released to the media on Thursday. The family owns Vigilant Investigative and Security Agency Inc. The solicitor general owns 60 percent of the company while his wife and three children own 10 percent each. He has repeatedly stressed that he resigned and chairman of Vigilant on May 30, 2016. The Calida family is seeking a temporary restraining order on the conduct of a legislative inquiry into the alleged conflict of interest in the solicitor general’s stock ownership of Vigilant Investigative and Security Agency Inc., which has multimillion-peso contracts with several government offices. According to the Senate website, a committee hearing was scheduled on Thursday morning but was cancelled. According to Calida, Trillanes, in letters dated August 1, invited the Calida family to an inquiry for the purpose of “’threshing out the various issues arising from Proposed Resolution No. 760." All five petitioners received the letter. “The letters dated Aug. 1 were all issued from the 'Office of Senator Antonio ‘Sonny’ F. Trillanes IV',” Calida’s petition reads. According to the Senate Legislative Information System, the resolution has been referred to the Committee on the Accountability of Public Officers and Investigations (blue ribbon) and the Committee on Civil Service, Government Reorganization and Professional Regulation, which Trillanes heads. Calida said that it leaves no room to discuss the issue. “Clearly the objective of the Proposed Resolution is to conduct an inquiry in order to humiliate and carry out the personal and hostile agenda of the Respondent,” the petition further reads. The senate resolution was signed by Sens. Trillanes, Risa Hontiveros, Franklin Drilon, Paolo Benigno “Bam” Aquino IV, Francis Pangilinan and Leila De Lima. The solicitor general also claimed that the Sandiganbayan has already acquired jurisdiction over the matter. Jocelyn Acosta-Nisperos, on May 10, filed a complaint against Calida at the Office of the Ombudsman. Former Ombudsman Conchita Carpio-Morales said in a public interview before her retirement that field investigators are already conducting fact finding investigation.